Lovely Jana has always had an interest in the performing arts. But when this scrappy lady decided to get into the ultimate performance art, she chose professional wrestling! Always learning, Jana has put an emphasis on absorbing all she can about her passion. The lessons she's learned from such ring veterans as Stevie Richards and Honky Tonk Man have already helped to propel this future star to numerous singles and tag titles. It won't be long before this optimistic young lady makes her own mark on the sport and becomes as well-known as the mentors from whom she's learned so well! The beautiful Jana smiles as she waits in her corner for the match to begin. The smile is gone as Jana pours it on in the heat of battle! The ring often turns into a dance party once Jana climbs through the ropes. "The Soul Sistas" are Luscious Latasha and Jana! Jana's hair flies wildly as she prepares to slam her opponent to the mat. Hair: Depends on the week. Eyes: Same as the hair! How It Started: I watched as a kid, but after a while I stopped because my parents didn't like it too much. I would check it out every once in a while...but didn't get back into it until my twenties. I had gained a background in the performing arts and felt a connection with the performance aspect of wrestling. So, being the Aquarius that I am, I wanted to learn this very different type of performance art. I started looking at schools and contacted a few in my area, but Camp IWF was the most impressive from the beginning. I went to an open house and felt comfortable with the atmosphere. After talking to AJ and some of the graduates of the program, I knew I wanted to really do this. Plus, I knew it would be a physical, emotional and mental challenge...and that is something that I thrive on! Gimmick: A woman looking to prove herself in a male-dominated sport. Wrestling Style: Old-School and Technical, but always adding new things when I can. Gear: I like black pants and a color top, although I like to change it up as much as I can. Titles Held: ACWA World Women's Champion; Revival Championship Wrestling Women's Champion; WXW Women's Tag Team Champion (w/Cindy Rogers); IWF Tag Team Champion (w/Steve Camacho); IWF Junior Heavyweight Champion. 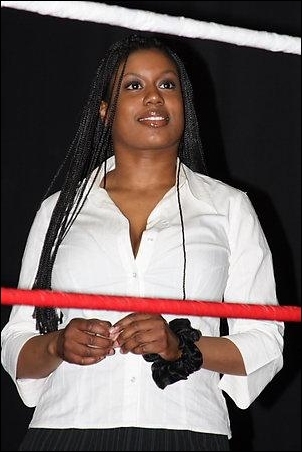 Biggest Allies: Shayla; Luscious Latasha; Missy Sampson; Amy Lee; Cindy Rogers; Biggie Biggs; Chris Steeler; Franciz; and my favorite ref, Matt Bennett. Most-Hated Enemies: Della Morte; Travis Blake; Antonio Rivera. Career Highlight: Attending the Pro-Wrestling clinics at Camp IWF that were run by Dr. Tom Prichard, Steven Richards, John "Bradshaw" Layfield and The Honky-Tonk Man. Each has a different perspective on the business and to be able to talk to and learn from them has been one of the most enriching parts of the learning process. That, along with the experience of the trainers and graduates, has helped me in so many ways. Favorite Wrestlers: Trish Stratus; Molly Holly; Victoria; Jazz; Jacquline; Shawn Michaels; Triple H; Ric Flair; Arn Anderson; Roddy Piper; JYD; Chris Jericho; The Undertaker. Wrestling Ambition: To continue to grow, learn, and to always enjoy my time in the ring. I love to read almost anything...whatever I can get my hands on. You can always learn something when you take the time to read.....My favorite colors are black, white and hunter green.....My favorite types of music are R&B, Funk, 70's & 80's soul music and John Williams' soundtracks.....I sing in my college choirs. I am an alto, but I can sing soprano and tenor when needed.....I am the oldest of three girls born in the same year.....I have to give a big thank you to Laurie for my hair!.....Finally, thanks to Kevin, AJ, Roman, Biggie and the graduates at Camp IWF. You have taught me so much. I don't know what I would have done without you guys in my life.